At first glance, Jordan Planitz seems to have boundless energy typical of toddlers his age. Nearly 3 years old, Jordan is in constant motion on a recent Monday — posing for pictures, playing with his ride-on toy car, climbing from floor to couch where his mother, Deanna Planitz, sits. “He’s come so far, so very far, much farther than anyone ever imagined,” Deanna said. 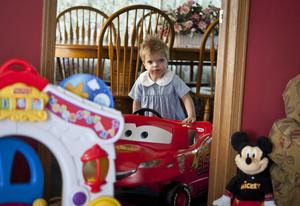 Jordan was born at Memorial Medical Center after a normal pregnancy. “If anything, I think we worried more about my age and Down syndrome,” said Deanna, who was 43 when she was pregnant with Jordan.